Lucy is still not sleeping, and I don’t really want to talk about it because I’ll probably cry if I do. SO! Let’s talk about Lucy’s hair, shall we? Lucy’s hair has gone through many stages. 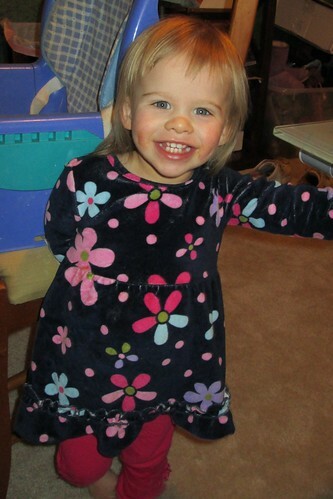 She was born with a full head of dark hair, which is kind of amazing considering how blonde she is now. 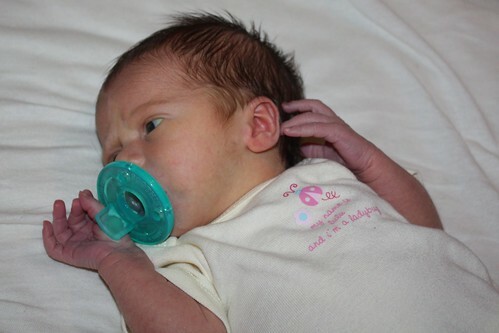 But within the first few weeks of her life, all of it fell out. And then she was bald. For a long, long time. Oh, she was so bald. But then she finally grew some hair. Very blonde hair. 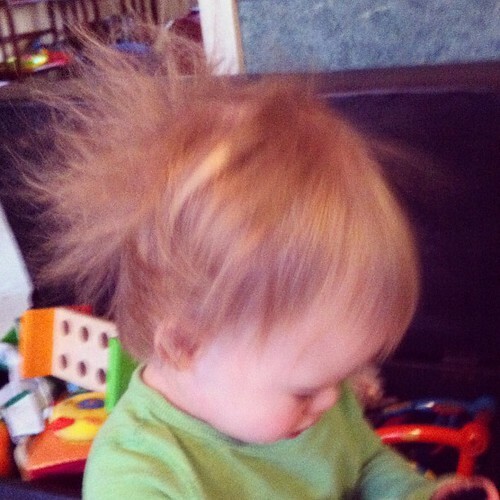 And then we entered the phase of Crazy Bed Head. 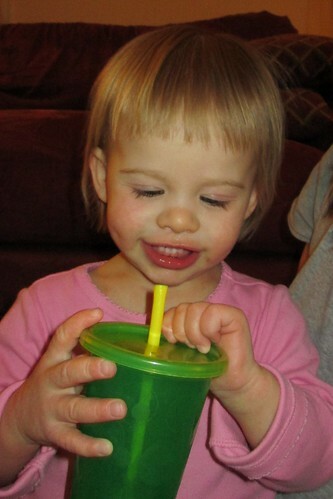 And even when the bedhead has been tamed, she has what I can only refer to as a Baby Mullet. It’s bad. 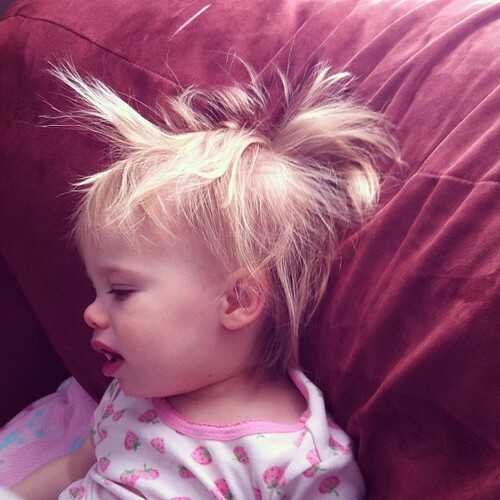 When Lucy sees the bottle of No More Tangles or the comb, she starts saying, “Ouch! Ouch! Ouch!” before I even touch her. So, I decided that was enough. I called my friend Kim, who does my hair and Catie’s. She told me to bring her in and she’d take care of it. 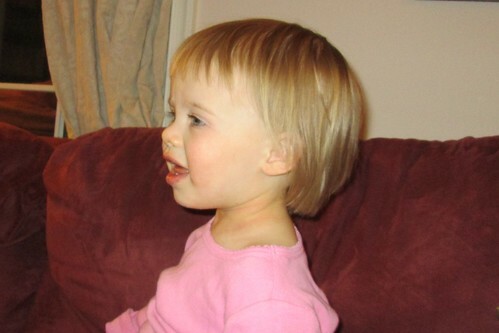 And now, my Lucy-goose no longer has a knotted up baby mullet. Gotta say, I kind of love it. It’s like an actual hairstyle instead of just an accidental pile of hair. 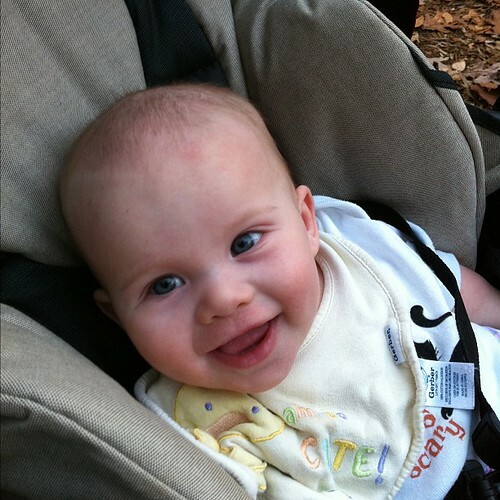 This entry was posted in Babies 'n Stuff, Girly Stuff, Lucy and tagged hair, haircut, Lucy, toddler by Cindy. Bookmark the permalink. I’m going to be 31 in March (oh sweet Jesus) and I still wake up with her bed head hair. My hair is insane. I do love her beautiful smile and I think it’s so cute she has a little hair style of her own. And I’m glad her bangs grew back from your mom’s hair style incident! Love her new ‘do! I hope she sleeps better ASAP!